June 2017. Recently we have discovered that Michonne is not, in fact, female. He has started to croak. Females of the species don't croak, so Michonne has had his name slightly altered to Michelin, since he somewhat resembles the Michelin tire guy. He will always and forever be named in honor of Michonne, though. First, I have to issue a disclaimer. I am certainly no expert in the area of pest control. I can only hope that my bumbling attempts to control them might help others, or at least make them laugh. If you try any of these, please use your own discretion; there may be other dangers or consequences to using these unscientifically home-spun methods that I have missed. To begin, I need to introduce you to Michonne. 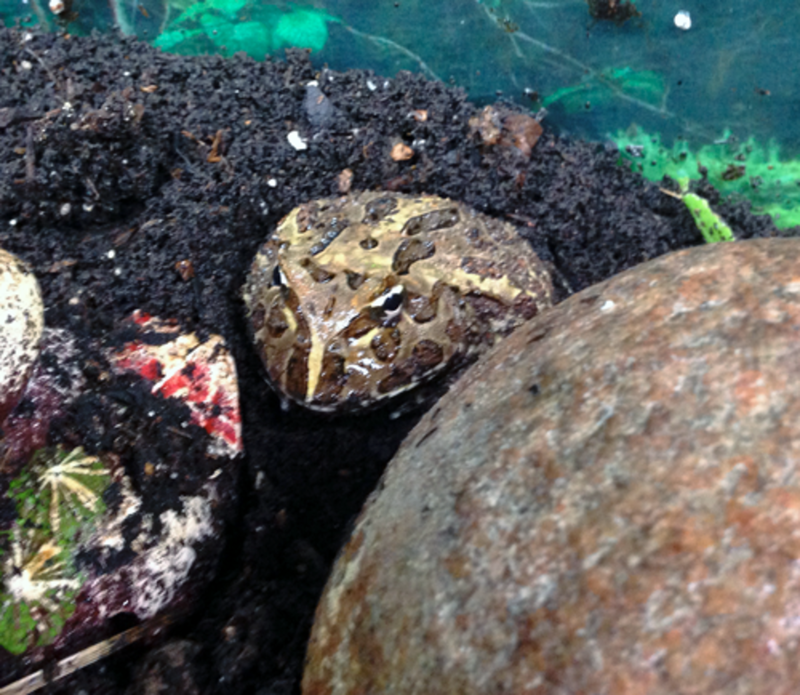 Michonne is a Pac-Man Frog. Wikipedia will tell you that she is of the genus Ceratophrys, in the family Ceratophryidae. 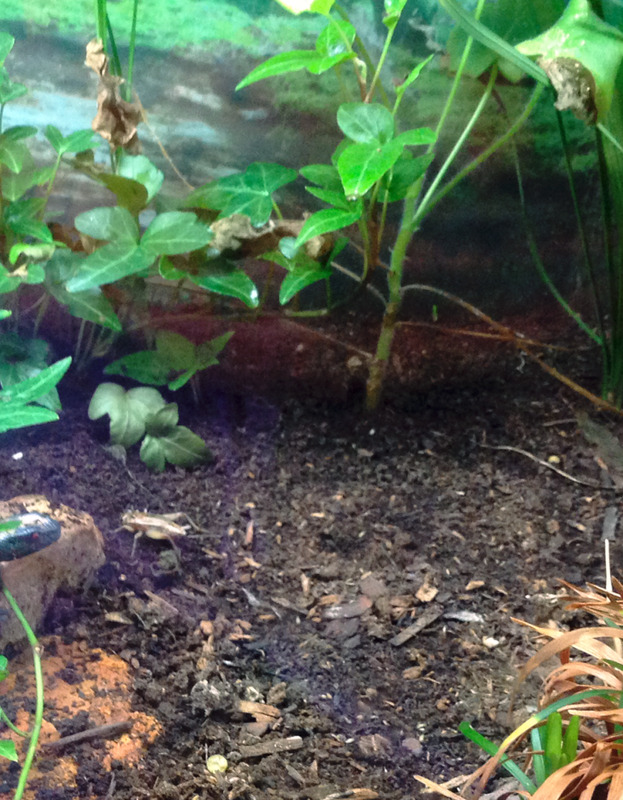 They are also known as South American horned frogs. They’ve earned the name Pac-Man frog from their large mouth and flat, round shape, which makes them look like the video character "Pacman". Mine has earned the name Michonne because she is very good at decapitating crickets. My oldest son also named her first meal "The Governor", so it seemed only proper and right, to name her Michonne. 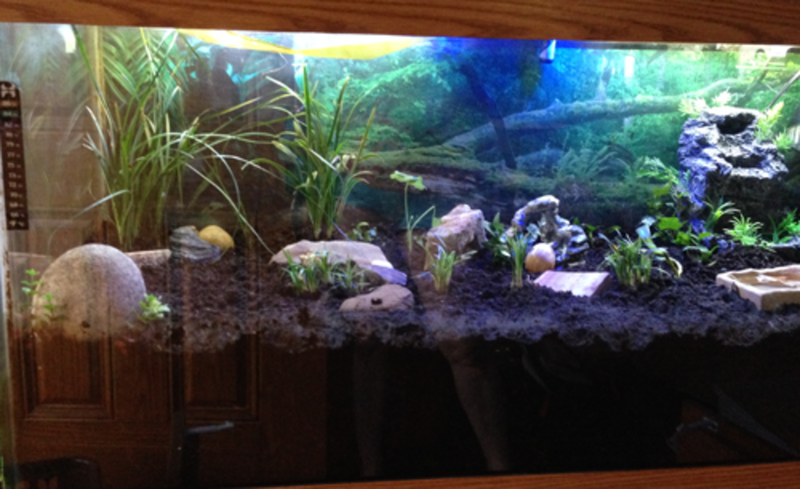 I like my pets to have a pleasant environment, so my Pac-Man Frog has a 75 gallon tank all to herself. I have a layer of lava rock on the bottom of the tank, with about 4 inches of heavy mulchy topsoil layered on top of that. 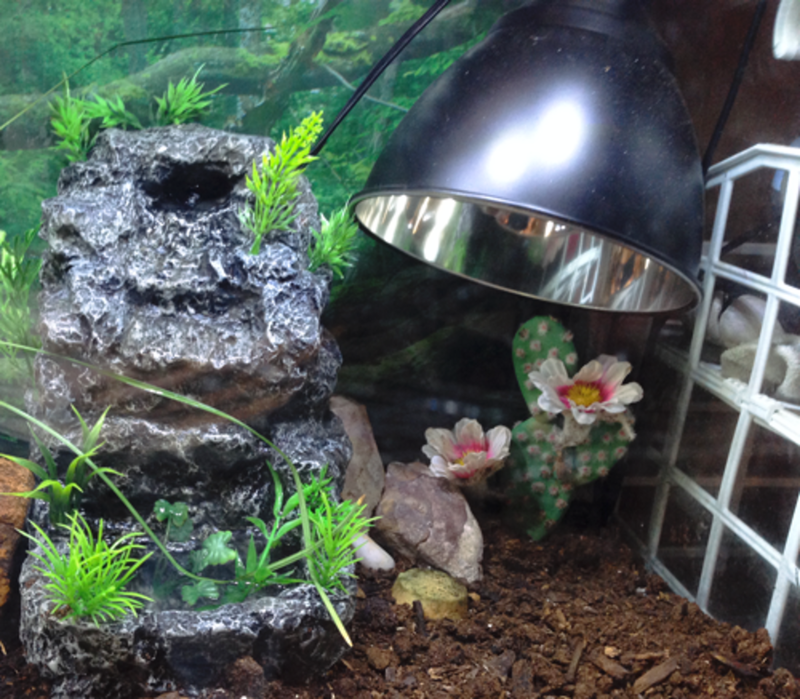 I planted several small plants in there, and keep the bottom layer, where the lava rock is, very wet. 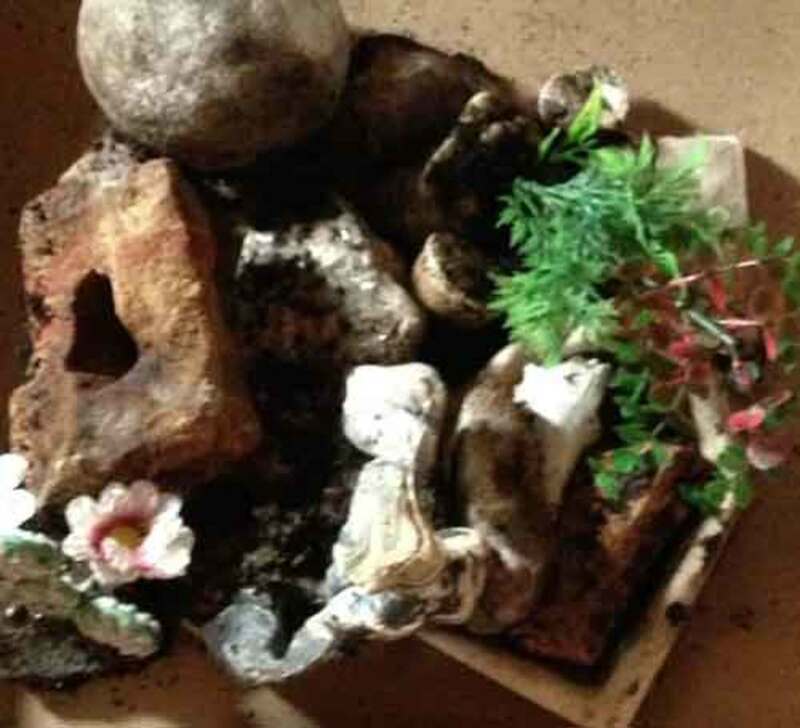 I have a little plastic fountain and a couple of dishes for water in there as well, and then scads of rocks and other nick knacks for decorations. I also have a heating element, which I turn on for her through the day and shut off overnight to mimic a more normal environment. I also have a temperature and humidity indicator just to be sure I'm not going overboard on anything. You want a fairly high humidity, and the temperature shouldn't go below 78 degrees Fahrenheit. Keeping it around 80 is better, although I do turn off the heater and let it get cooler overnight. You have to be careful about pesticides and fertilizer on your plants and in the dirt you choose. 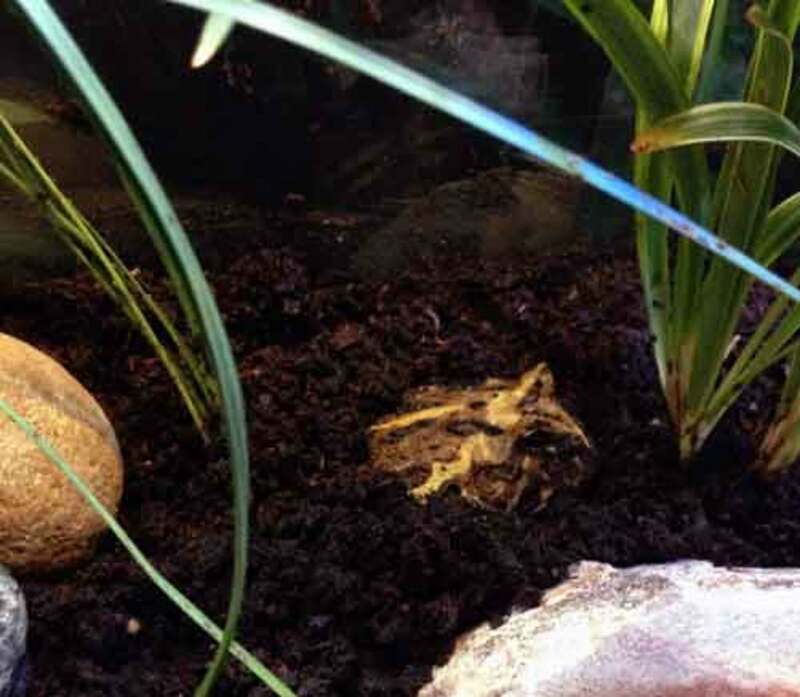 Pac-Man frogs absorb water and other nutrients through their skin, and so will also absorb these chemicals. Don't use top soils that are enhanced with any chemicals. Go with organic. Michonne has been kept fat and happy for the short time we've had her, which has been about 8 months, so far. I’m told they can live around eight years, and grow to be a handspan in diameter. At that point, she will need more than crickets, but we haven’t come to that stage yet. But this article really isn’t about the husbandry and care of Pac-Man frogs; it's more about her unwanted guests. Since we’ve had her, we’ve developed another issue. Gnats. 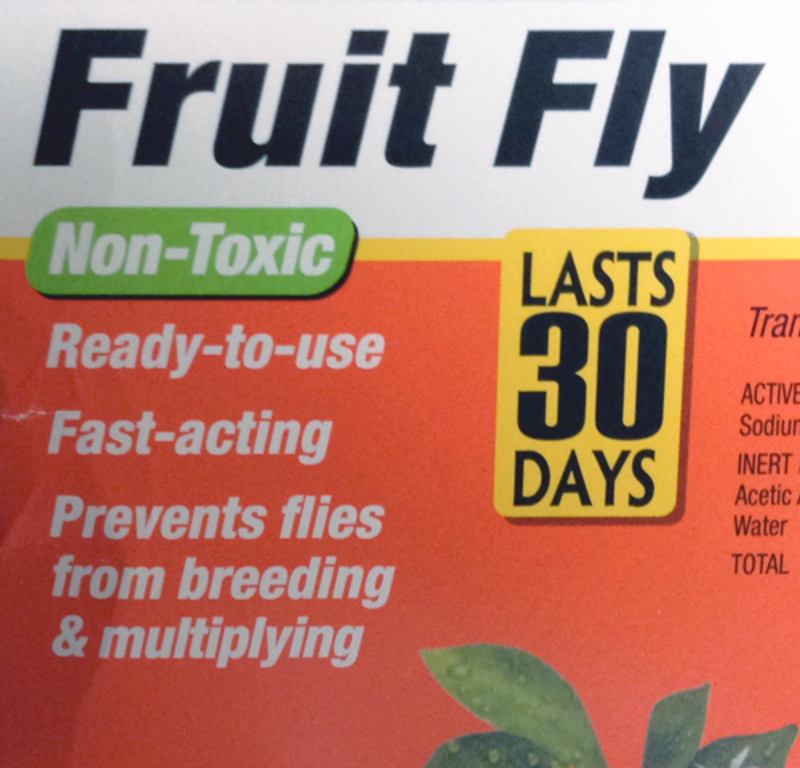 Also known as fruit flies. My original solution was to dump the entire contents of the tank and redo the entire setup, but I found that this unfortunately, did not resolve the issue. The gnats may come in with the dirt you buy, but we have also seen them in pet stores, flying out of the holding tanks where the crickets are kept, so it’s possible they come in with the crickets as well. The gnats don't really do anything, but anyone who has had gnats come in the house with their groceries (namely fruit) knows they can be extremely annoying. They like to fly up your nose and into your eyes, and are attracted to lighted items, like your lap tops or phones. As for Michonne, I had hoped she would eat them, but their small size and flighty movement does not seem to be enough to trigger her hunting interest. 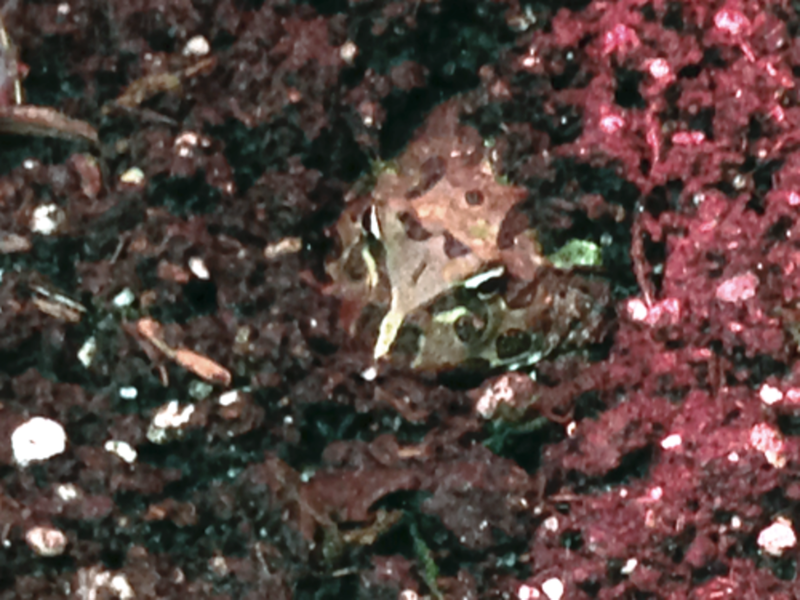 She is annoyed by them, however, and does her best to avoid being bothered by them by burying herself completely in the dirt. Pac Man frogs do this anyway, but she didn't do it so much before the gnats became an issue. The gnats escape the tank through any openings there may be in the hood, and proceed to annoy everyone else in the house as well, mostly at night. They flutter all over in front of your TV, tablet, or cell phone screens and then they proceed to happily fly right up your nose and into your eyes, and at this point, you understand completely why Michonne likes to bury herself in the dirt. For the most part, fruit flies are easy to get rid of. In your kitchen. You simply keep your counters clean and put your fruit away. But getting rid of them in a tank filled with dirt? Not so easy; because here, fruit flies have an infinite breeding ground, and don't simply "go away" as they do when they come into the house with your groceries. There, they end up on a cold, porous surface, but with Michonne, they end up in fruit fly heaven. Since I’ve had some experience dealing with unwanted insects before, I turned to my old friend, the Internet, for help. 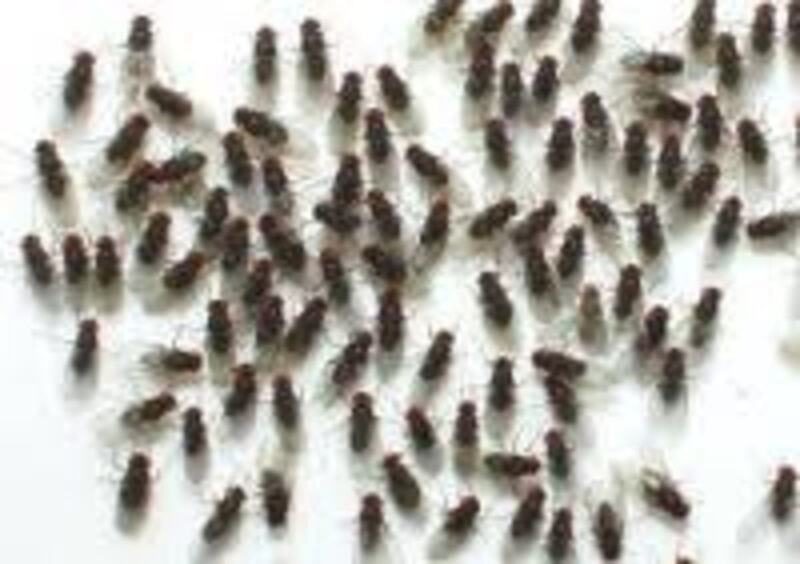 While the Internet has lots of solutions, most of them concentrate on removing the flies from your kitchen; there is really very little information about what to do for them in a terrarium environment. The best of the Internet solutions is to place a jar containing water, apple cider, and a splash of dish soap into the tank. 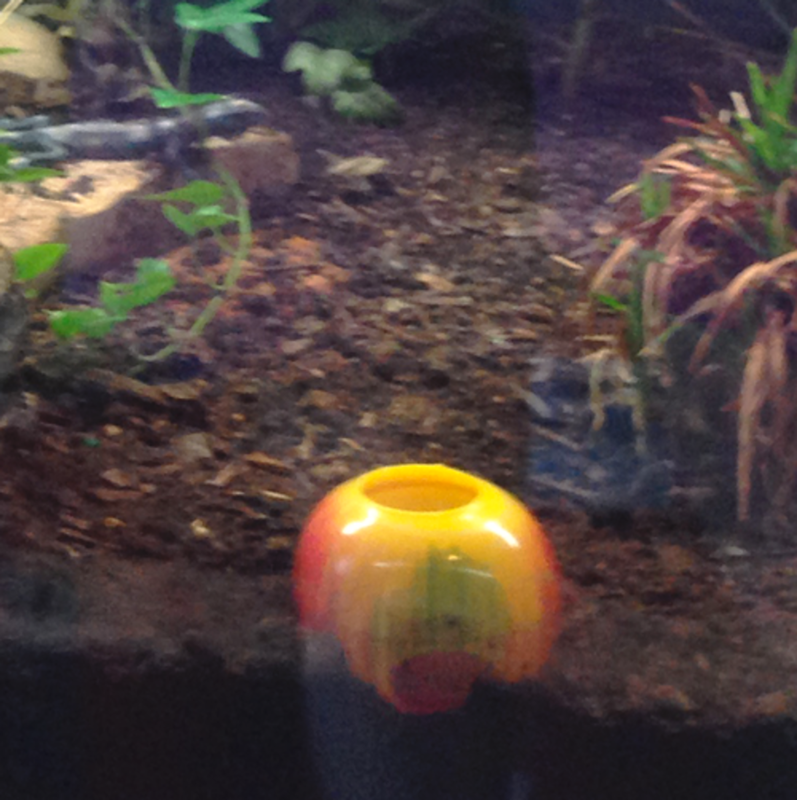 The frog and the crickets won't be able to climb up the glass jar and so ar safe from the solution. A lot of the instructions will tell you to tape a paper cone over the opening, to trap the flies in the jar, but I’ve found this to be unnecessary. The gnats fly in, attracted to the scent of the vinegar, and can't get out due to the action of the soap on the surface of the water. The soapy mixture won't allow them to land lightly on top of the water – instead, it causes them to sink into it, like quicksand. This method works. 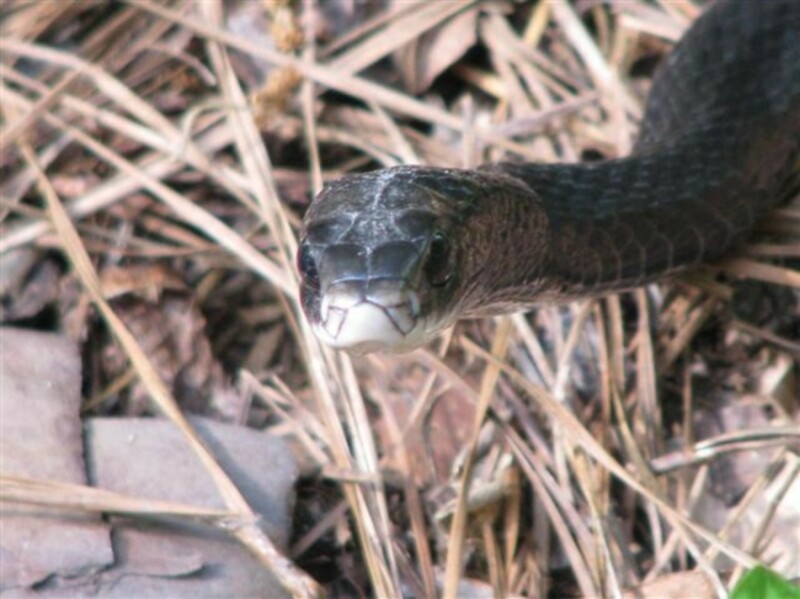 But it doesn't stop new ones from hatching, and it doesn't kill enough of the adults to end the cycle. So I experimented with other things. I tried using Terro Ant Killer, because I had some thought in my head that it might help stop the gnats from breeding. I didn't want to put this in the tank as it does contain a poison, so I put a small dish on top of the tank with a few drops of the the ant bait in the dish, and I added a touch of water to make it runny. This worked wonderfully as well, but in the same fashion as the vinegar water. They simply got stuck in the syrupy Terro drops, and died. I thought perhaps the gnats would eat it, then carry it back with them to help kill the other gnats living in the dirt, but of course it didn't work that way. Ants carry food back to their nests; gnats don't. It was probably a good thing they didn't; I hadn’t thought about Michonne eating them – and she does eat them, because as I said, they are more than happy to fly right up your nose or into your mouth. 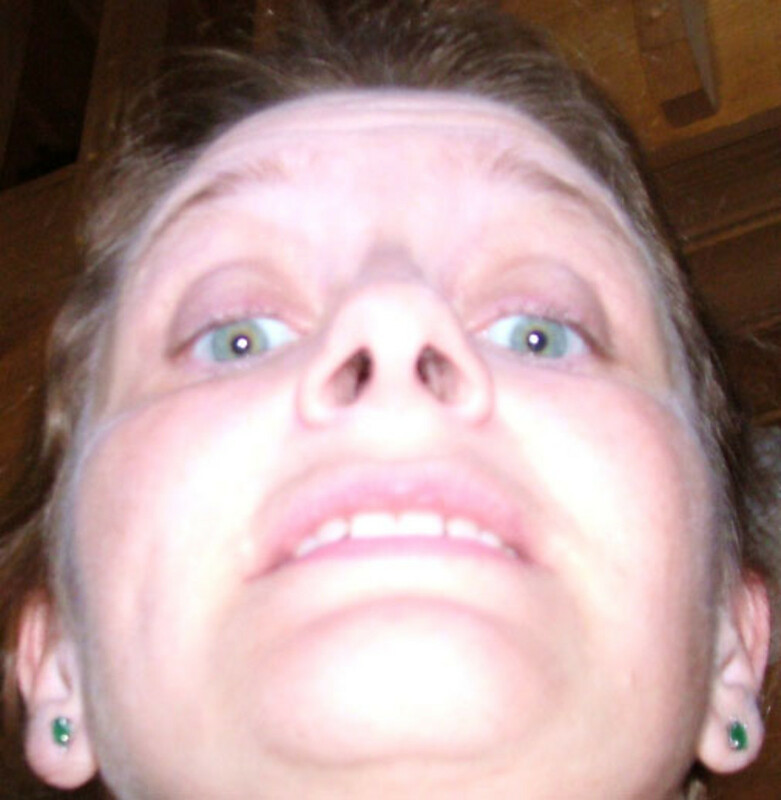 So, inadvertently, she is probably eating the gnats whether she wants to or not. I stopped using the Terro Ant Killer because of this, but the chances of her ingesting any were really very slender, since the flies never left the dish once they entered it. Remember to Read Package Labeling! 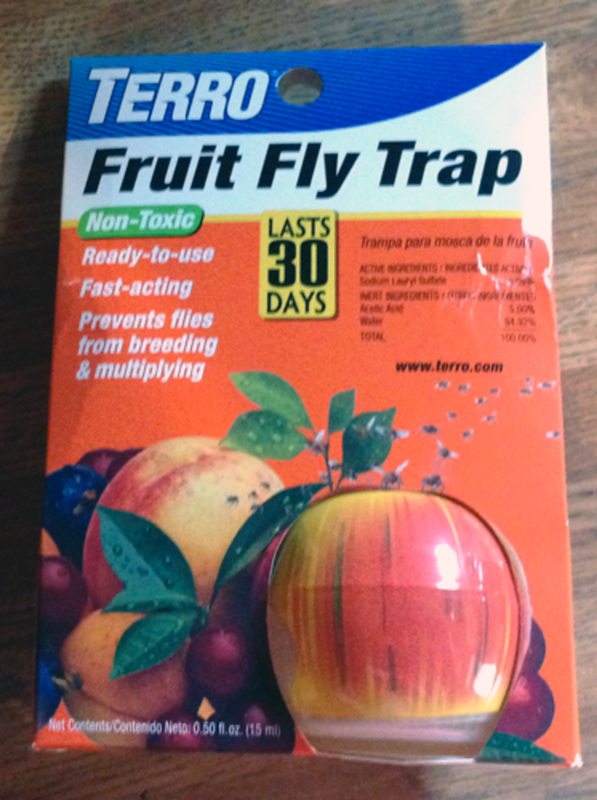 One day while out shopping, I came across these Terro Fruit Fly Traps - I've included a picture directly above. 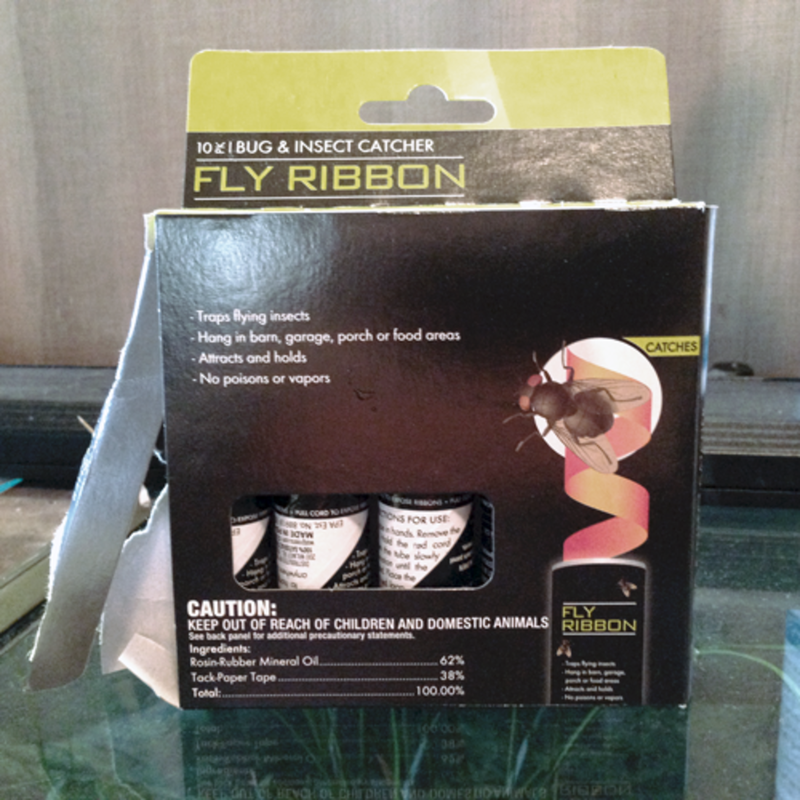 I admit; I became excited over the labeling, which stated that it would stop the flies from reproducing. I quickly purchased one and brought it home, where I then looked at the packaging more closely. Honestly, you should look at the packaging before you leave the store, but I don’t do that, so let that be a lesson to you. When I got the trap home and read the packaging completely, I realized to my dismay that I had been duped once again. The active ingredients included in the package are ascorbic acid and sodium laurel sulfate, which are pretty much the same ingredients as you have in the home-made vinegar water. So how does it stop them from breeding? I flipped the package over and read that the insects would get stuck in the solution and drown, thereby being unable to go back into the dirt and reproduce. Pft! After seeing all the hype over flea traps that will sterilize the insects and stop the eggs from ever hatching, I was disappointed to find that this, too, didn’t have some additive in it that would sterilizes the flies or prevent the eggs from hatching. Nope. It just drowned them the same way the home-made traps did. Just fancy vinegar water in a fancy package. The Truth is Out There - If You READ. So all my results up to this point had been disappointing, and dependent on keeping the gnat population smaller, but not completely eradicated, unless I want to completely redo the tank and completely change the dirt more frequently. Unfortunately, it doesn't take long for the gnats to set up shop and settle in. I suppose I could try baking the earth in the oven to sterilize it, but that could be a tricky job. I haven't attempted to try doing that as of yet. Then last week, I chanced across a box of fly strips. They come in little black tubes and when you pull on one end, a strip of paper unwinds, covered in what looks like thick honey, and it is very sticky, much in the same fashion as the wax that is used for hair removal. If you get your fingers in it, the strips become more difficult to work with because the sticky is attracted to itself. You can end up entangled in a twirled up mess of sticky, gooey paper. Fly strips are made for horse barns and porches. In a horse barn, you would simply hang the tiny tube, up high so that it doesn’t dangle too far, and then pull down firmly on the end that has a twist tie conveniently attached to it or easy grasping. It unravels on it's own and you simply let the strip hang there. Flies fluttering into the strip get stuck to the strip in much the same way as they get stuck in the soapy vinegar water - once they touch it, they can't get back out. 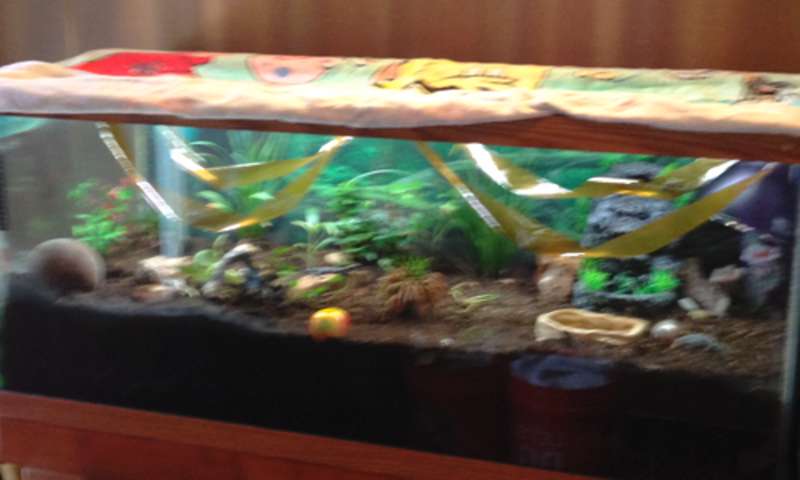 But you can't just hang fly strips in a frog tank. Can you? 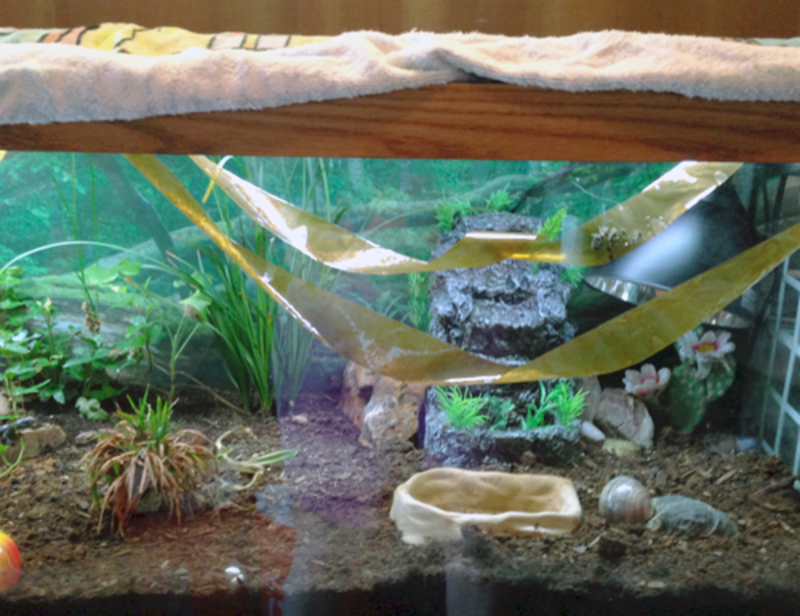 I unrolled four of the strips, attached them to one another, and carefully hung them inside the tank so they would be low enough to attract the bugs, yet high enough not to bother Michonne or her food. I had to attach a piece of tape to the ends of the fly strips to hold them in place, because even though the strips are sticky, it’s a liquid kind of sticky and they won't cling on their own; instead they slowly slide and eventually fall down into the tank. This would make for a bad situation if the frog or her crickets came in contact with the strip, so I made sure they held in place securely. Once I had the strips positioned the way I liked, I placed the glass tops back on the tank and covered all this with a towel to prevent any flies from escaping through openings in the hood. This is how it really went. Well, all this sounds simple, in theory. But see, you have to unroll the strips and flatten them, then cut the attachments- the tube and the twist tie- off from both ends. This was no real problem with the first one, except that you can't help but get a little bit of the sticky on your fingers. When I placed the first strip, I thought the stickiness would be enough to hold the strips in place. I stretched it across the tank opening and allowed it to droop down in the middle so that portions of it reached about the middle of the tank. That level was too high to trap crickets, but perfect to trap any flying insects. It was when I unrolled the second strip that the real fun started. As I said earlier, the sticky seems to have some sort of powerful, magnetic attraction to itself, like static cling. So as I unraveled and flattened the second strip, it wanted to nothing but stick to the goo I had previously gotten on my fingers. It’s very annoying. NOTE: If you are an impatient or easily frustrated person, don't try to do this alone. Not a good idea. Trust me on this one. On top of that, it wanted very much to stick to itself and to the other fly strip that I had already hung. When I tried to place it, it would actually swerve on it’s own in order to come in contact with the other strip. Then I had to pick the two strips apart, which caused me to get more and more sticky on my fingers... and on the sides of the tank, and on my arms… I think you can see where this is going. Finally, I allowed the two strips to stick together at one point, because it helped to spread the strips over more air space within the tank. The act of the strips sticking to themselves caused them to become heavier, and the horribly sticky ends I had used to hang from the edges of the top pulled free very easily, and plunked down into the earth of the cage. After I retrieved one end and rehung it, the other end would slide free – and let me point out that the loose ends would then roll up, as they had been in the tubes, and seek to stick very solidly to itself. This went on for some minutes until at some point I realized I was going to need to tape the ends to the top of the tank in order to hold them securely in place, because, as strongly adhesive as this stuff was to itself, it obstinately didn’t want to work in the same fashion when I wanted it to. I managed to get the two fly strips hung securely enough so that I could go find some scotch tape. At this point, all of my fingers and arms had come into contact with the goo, so when I did locate the tape, I stood there looking wryly at it, where it was just lying there, in the drawer... I wondered how I was going to manage picking it up. Well, one thing I do know about is how to work with hot wax for hair removal; that stuff is gooey as well. Using it requires a strip of absorbent paper, which you place over the wax that has been applied to the skin. The strip will then absorb the excess moisture, so when you pull the strip, with a firm yank, it pulls off the wax and the hair all in one motion, leaving nothing but soft hairless skin behind. 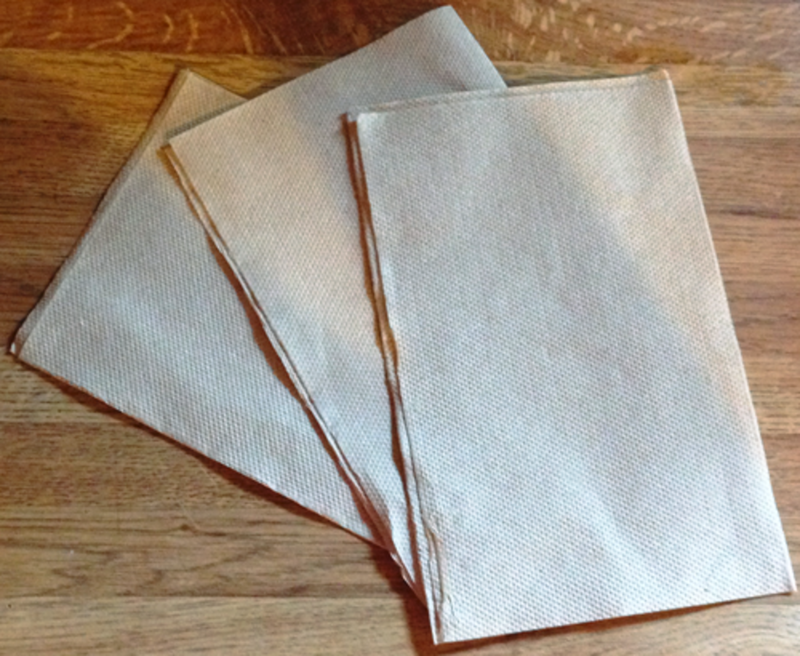 With this knowledge in the back of my mind, I looked for the brown “fast food” napkins we keep in the kitchen, which are very absorbent. I took one of these and stuck it to the goo on my hands and allowed it to absorb the excess moisture. Then I firmly yanked it off. It, of course, ripped into tiny little tufts and pieces, and left bits of paper stuck all over my fingers. Ah! But the bits of paper were relatively un-sticky, which was good enough for me to pick up the roll of scotch tape and work with it. I applied a strip of tape to each end of the fly strips attached to the outside of the tank top. One of them had eeled it’s way loose again, and was hanging in the dirt at the bottom of the tank, so I picked it back up and reattached it with the tape. At this point, another small, clustered up mess ensued, with the fly strips sticking to themselves and me, but I eventually managed to get the two strips securely in place on one side of the tank. Now the bits of paper on my fingers were covered with new sticky, and I wasn't about to start work on the second side of the tank after what I had just gone through doing the first side. So I went back out to the kitchen and used a second paper towel napkin to absorb the sticky. This time I worked at it until I got all of the paper off my hands, but I still had a sticky residue left behind which is enough to cause issues when trying to work with the strips. 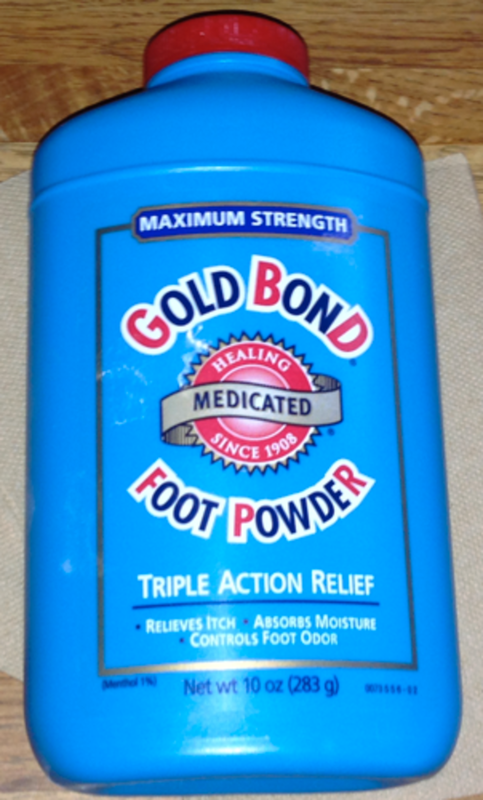 Foot Powder, Baby Powder: Absorbent - that's the key! This is when I pulled out the baby powder. Well, no. I actually didn't have any baby powder. I had foot powder. But hey, powder is powder. After absorbing most of the moisture using the paper towels, I sprinkled the foot powder onto my fingers and scrubbed it into the goo. Don't get it wet; use it on dry hands and just rub it firmly into all the sticky spots. This method works perfectly to remove the remaining residue, and it will remove it entirely; just make sure to really work it into the sticky. Roll the powder between your thumb and fingers until you can't feel the stickiness at all anymore. All gone. It works like a charm. Wash your hands well, as you don't want to get possibly medicated powder into the tank with your frog. 1. 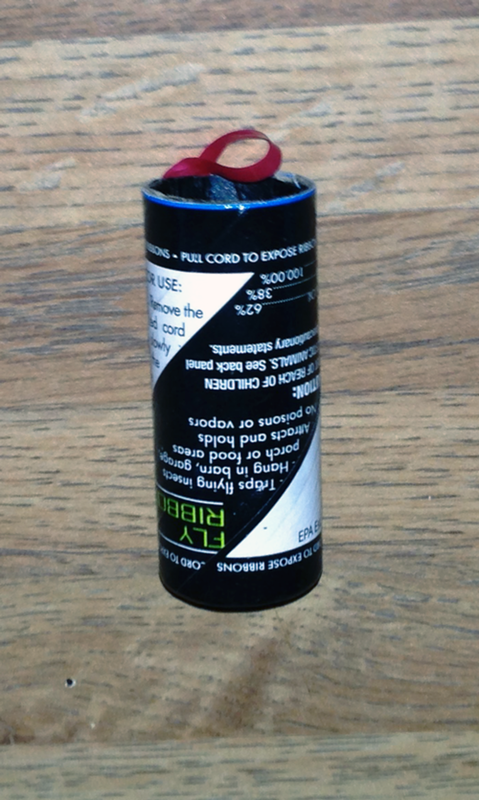 Open the fly strip tube, pull slowly, and turn the tube as you pull to unwind and flatten the fly strip as it opens. 2. Dangle the middle of the fly strip into the tank, and quickly attach the ends to the tank top using the scotch tape. There, now look at that. A Pro job. It would probably be more of a pro job if you clean your hands again before applying the second strip; which I didn't. In any case, you are going to find that the simple act of dangling the second piece of fly paper into the tank is going to be tricky regardless, as the strip will insist on swerving of its own volition and plastering itself against the first strip that is... well, was... already perfectly positioned. By the time it's peeled back apart and rehung, it's not so perfectly pro looking. But it's in there. So I back off, survey my work, and then retreat for another hand powdering. NOTE: Don’t leave out the step of using the paper towel - it really works to absorb most of the moisture and allows the powder to neutralize the sticky remnants much more effectively. Once my hands were clean, I replaced the tank top and placed the light in the center, then covered it all over with a towel to keep the gnats from escaping any opening in the hood of the tank. 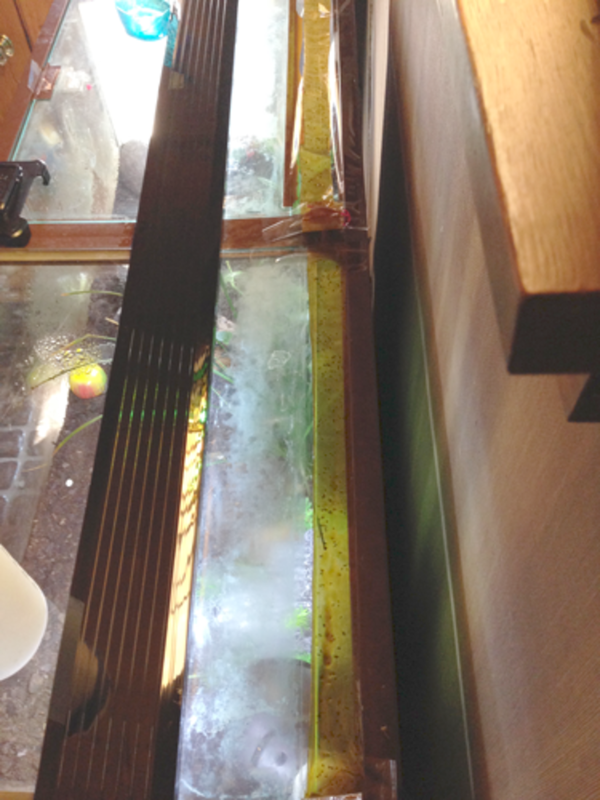 The towel immediately increased the humidity inside my tank, causing condensation to build up all over the glass inside. Michonne won't really mind that, but it's not very aesthetically pleasing to the pet owner. Neither are the strips, hanging there in all their yellow colored gooey-ness. 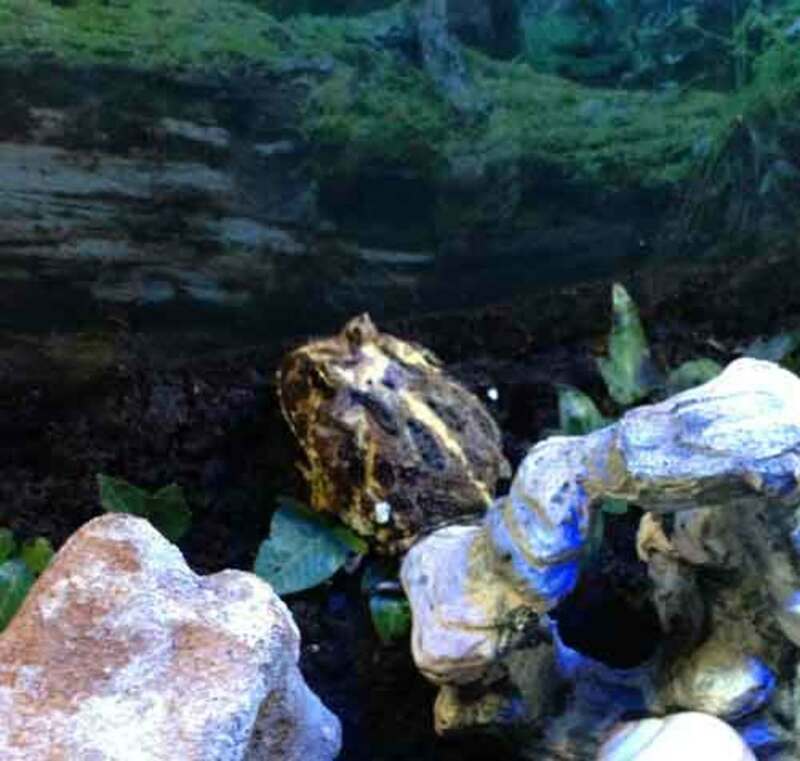 The condensation really only lasted a few minutes until the tank acclimated itself – the glass was clear again in about 15 minutes. Having completed this project, I now have to say that doing this was really not a very bright thing to do. Whenever you attempt to do anything, you need to take into consideration all of the things that can go wrong. You have to factor in both Chaos Theory, and Murphy's Law. If something can go wrong, you have to assume that, eventually, it will. I did leave the strips there for a few days with no issues, but removing them was an unpleasant business as they were then covered in gnats. Also, having to go through that every few days seemed to me to be too cumbersome and time consuming a process. There were too many aspects to this system where things could go horribly wrong, and besides that, it was just flat ugly to look at. It did work better than the vinegar and water, but I account that to more surface area of fly strip as compared to surface area of vinegar in the bottom of a jar. I would have to rate them as having the same effectiveness. The Best Method. So Far. So. This brings me to the final method I have attempted. So far. As I said before, my tank has openings around the top where the flies get out and annoy people at night, attracted to the light. So I decided to use this to my advantage. I carefully rearranged the hood and it’s attached parts so that the openings appeared all along the back of the tank, where normally air filters and fish tank tubing would enter anyway. I unrolled one of the strips and placed it to completely cover these openings along the back. Where they didn’t cover, I used clear packing tape overtop. I used clear packing tape to seal all the remaining openings around the edges of the top. 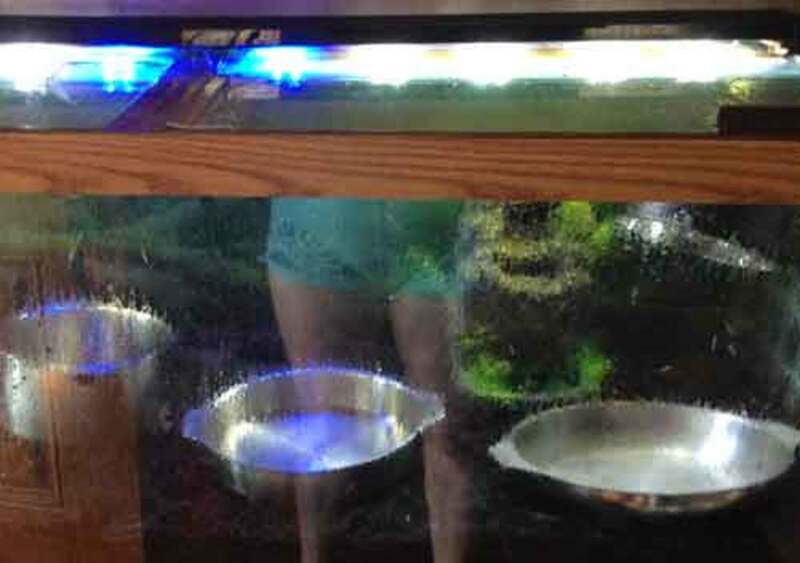 No towel or other covering is needed on the top of the tank, and this is a good thing; The towel changed the heat and humidity levels inside the tank, and overheated the light fixture. The towel also blocked other sources of light, which at this point are now important. The reason this method works best is because the flies are actually being attracted to the outside light source. The gnats bumble along the top, especially at night, looking for a way out, and eventually come into contact with the fly tape. So far, this has been the absolute best method of gnat control. 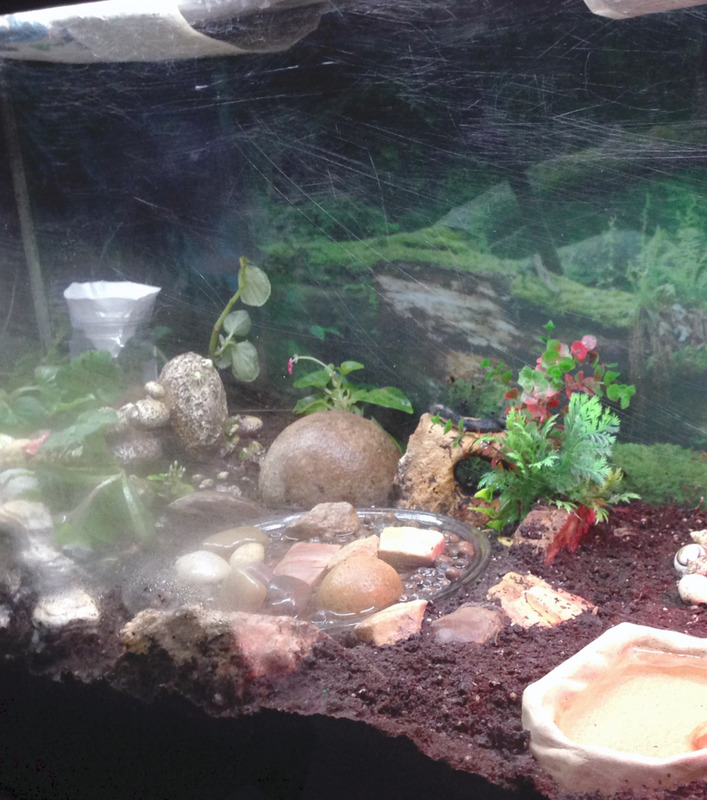 It captures the bugs as they try to escape the tank at night, attracted to the lights outside of the tank. It doesn't get rid of all of them, but it certainly works to control the population, making life easier for both Michonne and all the other residents of our household. You can change the tape anywhere from weekly to monthly. There is no odor at all that I have noticed. The one drawback is that the strips are sticky and more difficult to work with than a jar of vinegar, but to me, the results are definitely worth the added aggravation. If you have any comments (or better ideas! ), I would be very happy to hear them! Please leave me your comments, and I'll answer any questions I can. Please remember this is all just home-spun experimentation; no studies or real research has been done as to whether or not any of these methods are safe to use over the long run. Make sure to put the safety of your pet first. Well, the strips across the back work like a charm, however, it really hasn't done much to reduce the gnat population for me. After about 2 weeks, we started to see them fluttering around the house again. So I thought about it, and I thought, "Hmm. Bed bugs die from high heat. Maybe I should try that." I considered taking out all the dirt and putting it in the oven, but I really didn't relish that idea. Big, messy job. There HAS to be another way. So I took the plants, rocks, decorations and Michonne out of the tank, and plunked an electric room heater into the middle of it. Well, obviously, this didn't work well at all. The room heater kicks itself off when it reaches a certain temperature, and it wasn't nearly high enough to kill off any bugs. So I turned back to the oven again. I set it at about 400, and put a lot of pots and pans in there. My pots and pans have handles that pop off, so I didn't have to worry about anything melting or warping. Once the pots and pans were heated, I carefully pulled them out of the oven and placed them in the tank in hopes that the heat would radiate from the metal. The highest I managed to get the temperature to go was 90 degrees Fahrenheit. I was afraid to heat the metal pots too much - I didn't want to ruin them, crack glass, burn myself, or burn the house down. So I gave that idea up as well. My youngest son was watching this whole thing as it went on. He's used to his mother doing strange things, so he just watched me fail without saying anything at all, until I started removing the cooled pots. "Why don't you just pour hot water on them?" He says. "??!?!???!?!??!" I think. Well, duh! So I heated several kettles of water to the boiling point, and also reheated the pots and pans in the oven. I poured the boiling water over every inch of earth in the tank. Then, I placed the freshly heated pots on top. This caused a nice, billowing gush of steam, which saturated all to the air in the tank. 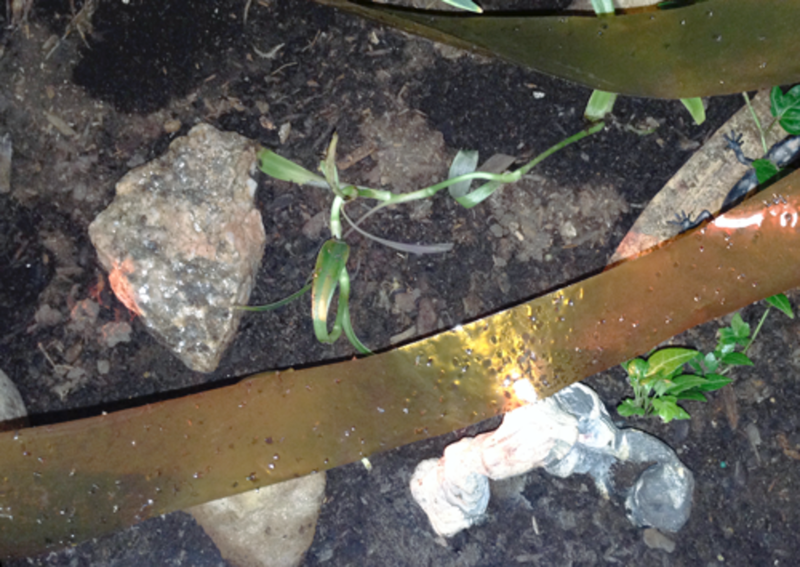 While I was waiting for that to cool, I took all the plants and carefully washed them, stem and root. Then I put all the decorations into a pot of boiled water and scrubbed them, too. Once they were cool and dry, and the earth was cooled in the tank, I set everything back up and returned Michonne to her home. I will have to wait and see how badly I shocked the plants by washing them. 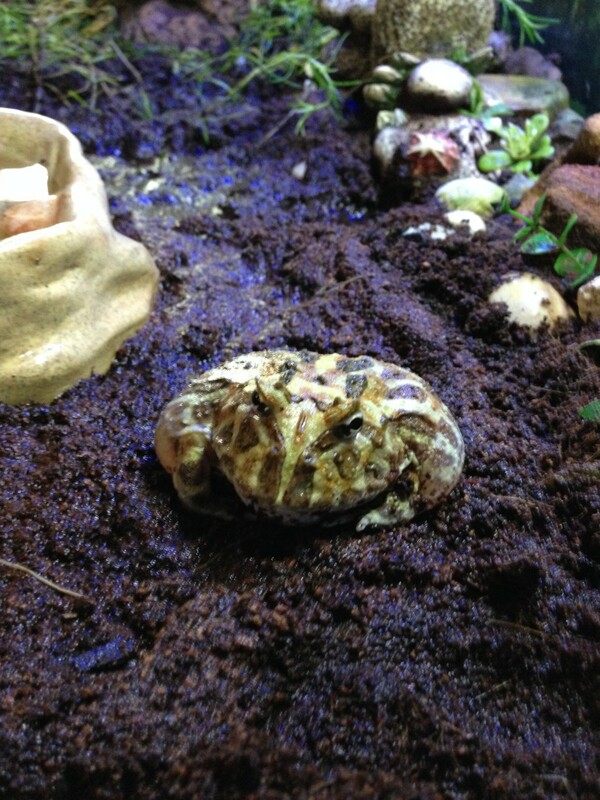 Michonne carefully explored her whole tank, took a dip in her water dish, then found a nice cozy place to bury herself. While I was setting the tank back up, I noticed 2 baby crickets had managed to survive the whole ordeal, so I know there are going to be gnats that survived as well. 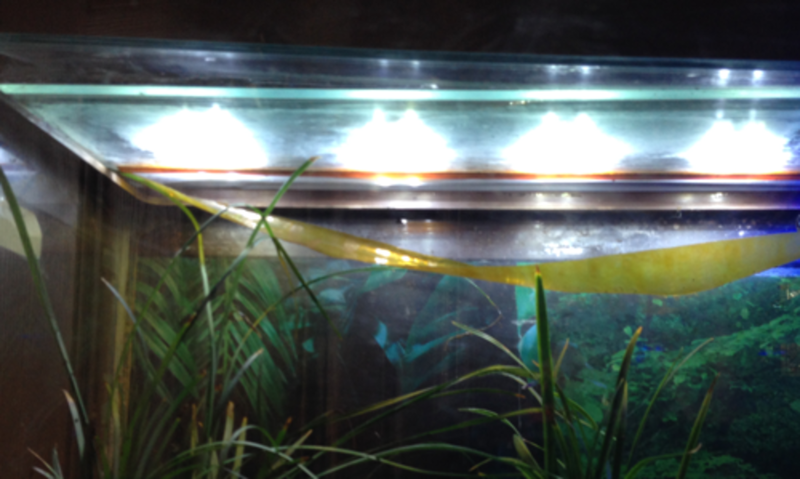 I still have the fly strips running across the back of the tank. I modified them to droop down a little further so that both the front and back of the strips are in use. Clear packaging tape covers any openings along the back of the tank top where the fly strips were placed. 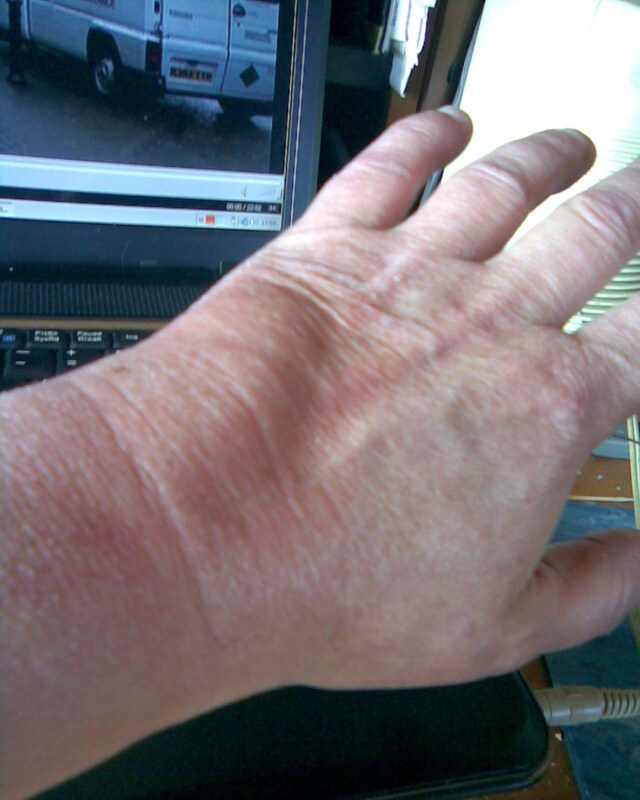 So, as of now, THAT is my best method of gnat control. My youngest son gets the kudos for this solution. 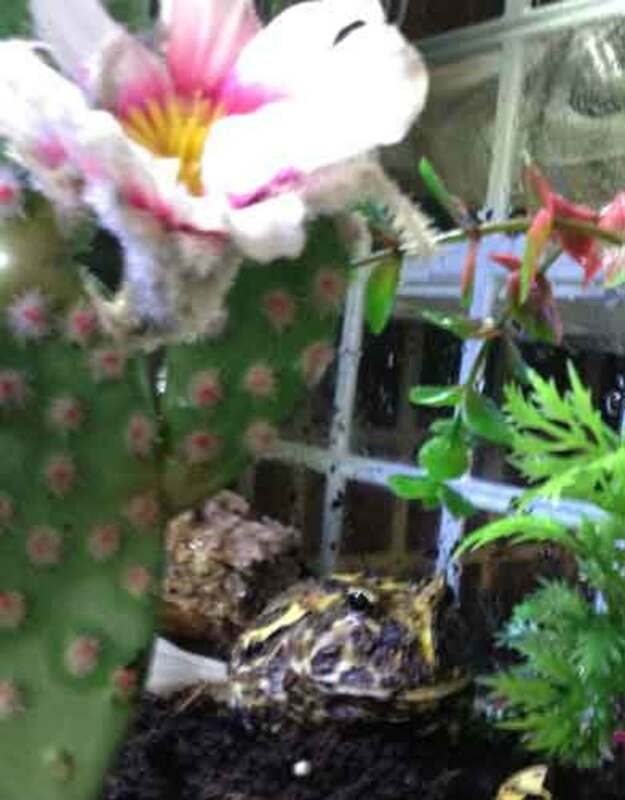 It is with a heavy heart that I must report the loss of my Pac-Man frog, Michonne. This occurred shortly after "her" name was changed to Michelin, because "she" started croaking. Only male Pac-Man frogs croak. I wanted to add this note due to how he died - I expect it could easily happen to any of you. It was due to a feeding error. Michelin was a fat and happy frog with a voracious appetite. He was getting bigger, and it was recommended to us to try feeding him mealworms. 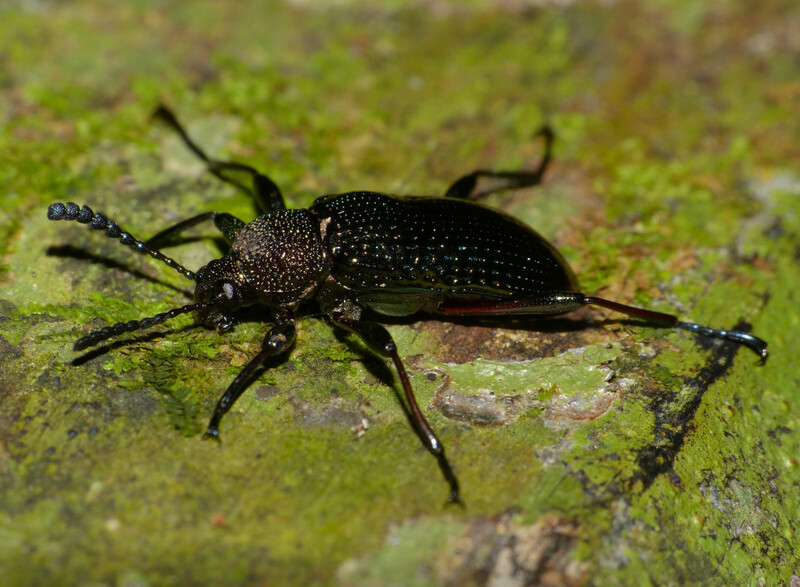 Mealworms are larvae for a large black beetle that have a very tough shell and large horned mandibles. Normally you don't have to worry about this, but Michelin lived in a large, 75 gallon tank, and so a couple of the mealworms he didn't consume for supper managed to escape - and grow into these big, black beetles. 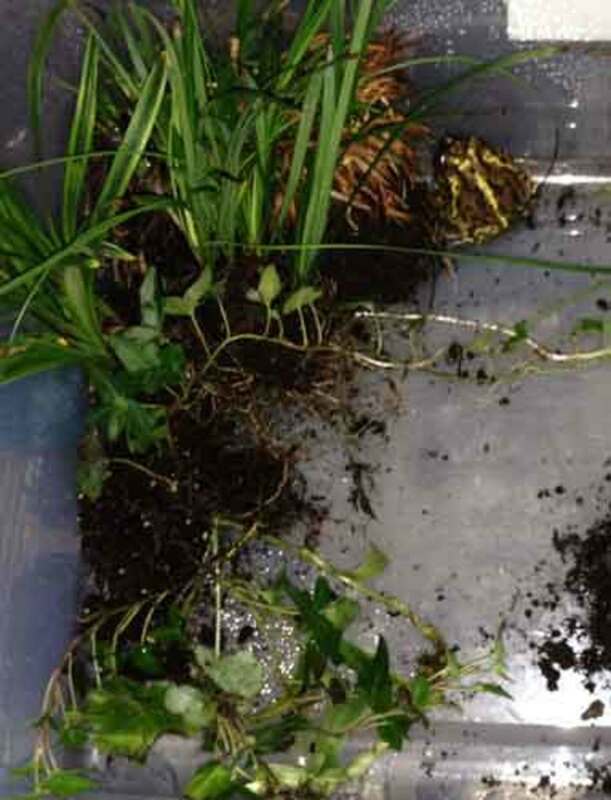 Like I said, Pac-Man frogs are voracious eaters, and have no problem wolfing down just about anything, however, these beetles aren't going to go down without a fight. 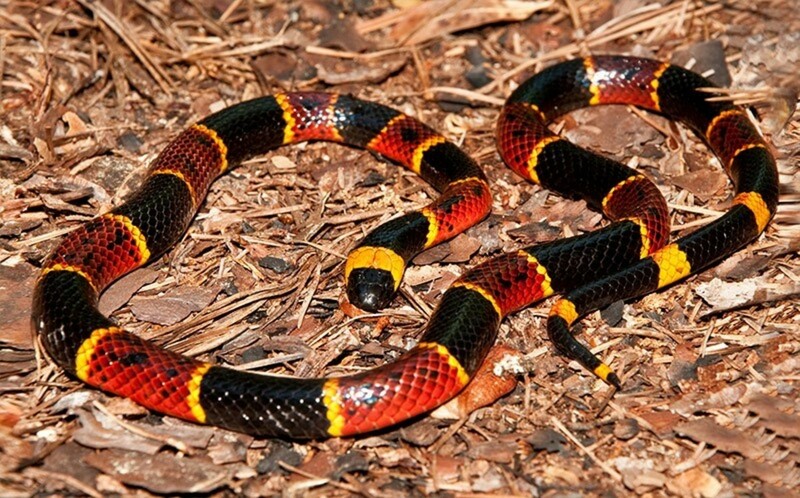 They will bite, and they will continue to bite, inside a frog's stomach. We believe this to be what happened to our Michelin, so I would like to pass on his story so that it can be avoided by others in the future. RIP Michelin. He was only 3 years old. Mealworm (Darkling Beetle) Lifecycle Printout. The mealworm is a the larval stage of the darkling beetle, Tenebrio molitor.